Dont’ you get tired living in the city? Although I like it very much here, our home in the province is still the best and happiest place for me. Didn’t I tell you that we live in spectacular views of the sea and hills? In front of our house are the most beautiful hills you’ll ever see and on the back, the view of the Pacific is just a wonderful treat especially during early morning and late afternoon. That picture above is the typical scene you’ll see in our garden during summer. 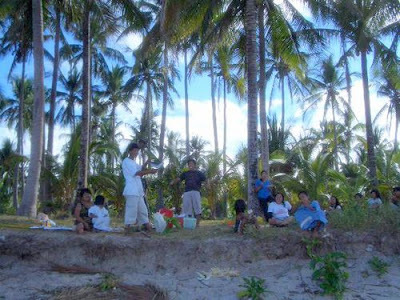 Picnic at the grassy ground by the beach while barbecue and fresh buko juice are served. This was taken 2 summers ago. Gosh, I realized I haven’t gone home for two years now. I miss that place. I especially miss our garden. I used to spend a lot of my time there….just lying on the ground, reading my favorite book and enjoying the spectacular view. I probably need this strimmer grass trimmer to help me cut those unwanted grass that pops out every now and then when I get home next year. It’s not too big and doesn’t look so heavy. What we use back home to trim the grass are the old fashion ones that look like big scissors and they’re very dangerous. Well, this Black & Decker Strimmer grass trimmer cuts more grass, very easy to use and you wont compromise your safety. It’s also battery powered and cordless, you just have to charge it once you use it to trim your garden. It doesn’t just save your time and effort, it’s also safer to use. I really can’t wait to go home. Too bad, summer is still 8 months away. i really like this song so how can i get all word of this song, i mean song book?